Today is the last day of my first year here. I've moved out of the adorable tiny house I rented this year from a professor on sabbatical in Guatemala. When I return for year two, I'll be renting a beautiful but bigger house from a professor on sabbatical in Germany. So I packed up all the huge quantity of stuff I had brought with me last summer from Colorado, plus the huge quantity of stuff I have somehow acquired during my year here: books! clothes from my new favorite boutique, Greencastle Goodwill! and two fabulous cookie jars! and more! All of that has been moved to my fortunately spacious office at the Prindle Institute. I'm flying back to Colorado, not driving, so I'm taking only a carry-on suitcase and small backpack on the plane. I will have tears in my eyes as I lock the door of my little house for the last time. I have been so happy here this year, even though the year turned out to be very different in many ways from what I imagined. I thought I'd have endless hours to start writing the memoir I've been thinking about, to read and write poetry, to proceed on my 2012 writing resolution to write "a book that surprises me." Well, I did do a considerable amount of scholarly writing, as well as two chapter books that were rejected by either my agent or my publisher (note: rejection is good - it means you're stretching and growing), and the start of two chapter books that did get accepted. But mainly I threw myself into the intense intellectual life of this small college in the middle of a small rural county in western Indiana. I taught three successful classes, including one I had never taught before. I participated in six reading groups in the fall and five reading groups in the spring. I attended countless talks and concerts. Seldom was there ever an evening I was home. I explored so much of Indiana - drives to see the covered bridges of Parke County, New Harmony and Lincoln's boyhood home with my sister, opera in Bloomington, the maple syrup festival. I had weekend trips to Milwaukee, Chicago, and Cincinnati. I reconnected with dear old friends. I made dear new friends. Overall, I would say that this year I've been about as happy as a person can be. And there is a lot to be said for happiness. Indeed, one of the happy events I attended this year was an entire retreat/seminar on happiness. Now I could lead that retreat and teach that seminar. And after six sweet weeks back in Colorado, I'll return for year two. Here's hoping it will be as happy as this past year has been. But it could be a tenth as happy and be happy enough. Today is the 300th birthday of Jean-Jacques Rousseau, born June 28, 1712, in Geneva. 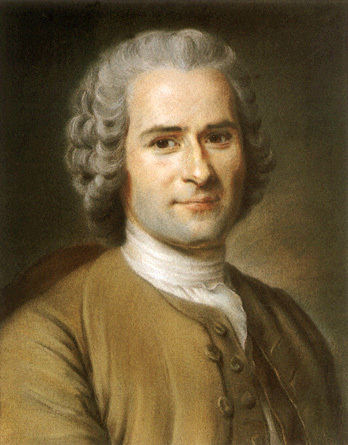 I teach a "single philosopher" course on Rousseau regularly; it is one of my two "signature courses." (The other is Intro to Ethics.) I consider something to be a signature course if you would get a very different course (not necessarily a worse course, but definitely a different course) if you took it from somebody not me. My Rousseau course is different from anybody else's because I love Rousseau more than anybody else does. Most of all I love the passionate intensity with which Rousseau engages life, the intensity of what he would call his "sentiment of existence." His autobiography, The Confessions of Jean-Jacques Rousseau, was the first great modern autobiography, striking for its shockingly candid confessions about childhood sexuality (Rousseau had a predilection for "chastisement"), deeply regretted misdeeds (he cast blame upon a fellow servant girl for the theft of a ribbon he himself had pilfered, leading to her dismissal and likely ruination), and bizarre life choices (he had a prolonged sexual relationship with a female mentor, Madame de Warens, whom he regarded as his "maman"; he had five children with the woman who later became his wife, an illiterate chambermaid, and gave them all away to a foundling asylum). "How can you like such a person?" I'm frequently asked. I like him because he tells us all of this without hesitation in a book that makes for riveting reading on every page. My students always tell me how glad they are that we begin and end the course with reading the Confessions. We also read Rousseau's novel, Julie, or the New Heloise, the best-selling novel of the 18th century. I have to admit that my students are less pleased about this, as the novel is extremely long, told in letters that run to twenty or thirty pages in some places, recounting the doomed love between Julie and her tutor, who is given the alias of St. Preux. His real name is never disclosed, presumably so that readers can suspect that it might be none other than Jean-Jacques himself. In his treatise on education, Emile, which reads in places like a novel, the fictional tutor of the fictional child, Emile, is actually called Jean-Jacques. The man did not have a small ego. But he had prodigious talents that would justify a large ego. His Discourse on the Origin of Inequality, a hymn to what humankind has lost as we moved from "savage man" living in an amoral, innocent state of nature to the corrupt artificiality of civilized society, was a founding document of romanticism. His On the Social Contract was a founding document of the French Revolution's call for radical democracy. The child-centered educational methods of Emile are influential to this day. His late-life collection of essays, Reveries of the Solitary Walker, are masterpieces of French prose. Oh, and he also wrote an opera (score and libretto) that was the toast of Paris - Le Devin du Village (The Village Soothsayer). So happy birthday, my dear Jean-Jacques. I wish I could be in Geneva for the festivities. Instead, I'll observe the day with a solitary walk, filled with reveries of a tormented, brilliant, paranoid, sensitive, witty, narcissistic, fascinating genius. Last Sunday afternoon I went with my dear friend Keith to a church ice cream social in celebration of the 175th anniversary of the Putnamville United Methodist Church. Putnamville is a tiny hamlet around five miles south of Greencastle. To get there, we could have driven on a major road - state highway 231 to state highway 40 - but knowing how I love the back roads of Indiana, Keith chose a route on narrow county roads that wound past fields of corn and soybeans. The church social featured grilled hotdogs with all the trimmings as well as an excellent selection of home-made pies. We shared a piece of the raspberry pie: delicious. Music was provided by a bluegrass gospel band called Upward Journey, playing toe-tapping tunes like "I Saw the Light" and "Leanin' on the Everlasting Arms." I could have sat there listening to the music and eating pie forever, but Keith and I had to get on the road to head to Goldsmith, Indiana, population 200, Keith's home town in rural Tipton County, where we attended the Sunday night card game that has been going on for FIFTY years, since the players were small tykes hanging out at the town wallpaper store. I don't play cards but loved listening to the banter of these friends of many decades. So first my day had old-time religion. Then it had an old-time card game of old-time friends. Gimme that old-time Indiana! In the pleasant afterglow of the Prindle Institute happiness retreat that I attended two weeks ago, I have been on the prowl for more insights into how to be happy. Browsing in the surprisingly well-stocked bookstore in Logan Airport on my way home from the Children's Literature Association conference in Boston last weekend, I stumbled upon The Geography of Bliss: One Grump's Search for the Happiest Places in the World, by Eric Weiner, and snapped it up. It proved to be a delightfully entertaining and insightful read. A veteran foreign correspondent, Weiner decided to spend a year traveling the globe, "seeking out not the world's well-trodden trouble sports but, rather, its unheralded happy places." Working off the World Database of Happiness, he selected ten countries to visit in order to figure out why they were happy, or in some cases (Qatar, Moldova) unhappy. For each country he distilled some core lessons on happiness, always with witty commentary about the various characters he encountered along the way and the stories they shared. The full list of countries: The Netherlands, Switzerland, Bhutan, Qatar, Iceland, Moldova, Thailand, Great Britain, India, and America. Money matters, but less than we think, and not in the way that we think. Family is important. So are friends. Envy is toxic. So is excessive thinking. Beaches are optional. Trust is not. Neither is gratitude. The country that appealed to me the most, from Weiner's portrait of it, was Iceland, which he visited in the dead of its dark, dark winter. He summed up his lesson from Iceland as "Happiness is failure." One of the reasons Iceland is such an enjoyable place to live is because it produces more artists and writers per capita than any other nation. Why so much creativity? One of Weiner's interviewees, Larus Johannesson, tells Weiner that "It's because of failure. . . Failure doesn't carry a stigma in Iceland. In fact, in a way we admire failure." If you're free to fail, Weiner realizes, this means you're free to try. He decides that while Americans like failure, as an appetizer to whet our hunger for the story of spectacular subsequent success, "For Icelanders, failure is the main course." Weiner explains that, "There's no one on the island telling [Icelanders] they're not good enough, so they just go ahead and sing and paint and write. One result of this freewheeling attitude is that Icelandic artists produce a lot of crap. They're the first to admit it. But crap plays an important role in the art world. In fact, it plays exactly the same role as it does in the farming world. It's fertilizer. The crap allows the good stuff to grow." Okay. Off to write some fertilizer. And make myself a bit happier in the process. Yesterday I had, to quote Judith Viorst, "a terrible, horrible, no-good, very bad day." A big project that I had screwed up royally occasioned a tense conversation with someone I love, and I don't handle conflict very well - actually, I can't deal with conflict AT ALL - so when I have conflict, I cry, which never improves matters, for what is more pathetic, really, than a 57-year-old crybaby? So at 4:30 I left work and slunk home to spend the evening wallowing in misery. Here is the important thing: I wallowed in misery for the next several hours, but I didn't do anything to make things even worse. I had already had a huge late lunch, but I could have driven to Dairy Castle and bought myself a cheeseburger AND a hot fudge sundae with their wonderful black raspberry ice cream, thereby undoing a week's worth of careful eating monitored by My Fitness Pal. I didn't do that. And there is a certain person I was tempted to call, thereby undoing two weeks' worth of resolve not to call this person. I didn't call this person. Instead I got in bed and read for the entire evening: Beverly Cleary's two memoirs, A Girl from Yamhill and My Own Two Feet, reading that I need to do to revise and expand my paper on Cleary's Henry Huggins and Ramona books for the book being made out of the papers from the China conference. So in a small way, I actually made my life better. But making things better is more than we should expect of ourselves when it's wallowing time. It's enough that we just don't make things worse. This morning I woke up and weighed myself and had a pleasant number to record to My Fitness Pal. I felt glad I hadn't made any phone calls to regret afterward. I walked to the Greencastle farmers' market and had a blissful hour sitting in the shade chatting with the knitters and crocheters who congregate there. Now I'm going to drive to Bloomington with my friend Keith to see The Best Exotic Marigold Hotel and have an early dinner. Things are going to be okay. They always are, sooner or later. But because I didn't make things even worse on my bad day yesterday, things can be better sooner rather than later. And I'm grateful for that. In books, especially in books for children, the main character faces some problem that is usually solved by her coming to learn some truth about herself, or about the world, or about her place in the world. I love these epiphany moments in books, if they aren't too heavy-handed and didactic. These are the moments when, as a reader, I get joyful tears in my eyes at the rightness of what is being learned, particularly if it's something that speaks to me on a deep personal level, addressing some demon I've been wrestling with in my own life. But here is one key difference between literature and life. In literature, the main character learns a lesson, and it stays learned; if there's a sequel, she goes on to learn some different lesson in the next book. In real life, we have to learn the same lesson over and over - and over - again. I remember that a year ago I blogged about learning how to delegate, as I was cleaning up a devastated property for sale and desperately needed and welcomed the assistance of an army of brilliant, hardworking graduate students who came to my rescue. Delegating is the key to success! I think I wrote something to that effect in this very blog. Today I learned that same lesson again. I'm working on the logistics for the conference on Ethics and Children's Literature that I'm organizing at the Prindle Institute for Ethics this coming September. It's to be a major and wondrous event. I have three keynote speakers: Susan Campbell Bartoletti (award-winning children's author who writes about ethically charged subjects like youth who worked for and against Hitler, and the Ku Klux Klan); Claudia Nelson (prominent historian of children's literature,who can talk about changing approaches to shape children's ethical behavior through children's literature over the years); and Thomas Wartenberg (philosopher who uses children's literature in school settings to get kids to talk about ethical issues). I put out a call for papers to children's literature scholars, philosophers, and authors, and I got a terrific batch of submissions and reviewed them with an insightful colleague and then sent off acceptances. But now I have to do the actual work of making it all happen. Being still of a fatal do-it-yourselfer cast, I muddled along for a while, but then it became clear to me, abundantly clear, that it was time - well past time - to have a meeting with my fabulous coworkers at the Prindle. Well, within a very few hours, I had a real working budget for this event (a budget I wish I had made sooner, but oh, well), and an amazing color-coded spreadsheet for all the participants (a spreadsheet I wish I had made sooner, but, oh well). Oh, my darlings, delegate! When you are surrounded by people with better budgeting and spreadsheet-making skills than yours, delegate! Do it before you mess everything up, rather than after! And if after,do it as soon as possible after! You will be so glad you did! I'm working on revising and expanding the paper I gave at the conference in China, "Wimpy Boys and Spunky Girls: The Image of the Gendered Child in Postwar American Children's Literature," for the book that will be created from the conference presentations. For one thing, the paper needs a more informative title, for it is really a paper on the Henry Huggins and Ramona Quimby books of Beverly Cleary, which in my view created a certain archetype of a hapless boy who has various misfortunes befall him versus an exuberant girl who is filled with unconventional ideas for irrepressible adventures. As part of this task, I'm now reading Beverly Cleary's two memoirs: A Girl From Yamhill and My Own Two Feet. As a child, Cleary herself was very like Ramona. I've read 130 pages so far, and in the space of those pages little Beverly has put inky hand prints all over the white damask tablecloth at the family's Thanksgiving dinner and set off on a walk around the world as well as a walk around the ledge beneath her home's mansard roof. In fact, little Beverly is exactly like little Ramona in puzzling over the words of the song about the "dawnzer lee light" and naming her doll after a motor vehicle: a car for Ramona (Chevrolet) and a tractor for Beverly (Fordson-Lafayette). I've just reached the part of the book where Beverly Cleary has her first success as a writer, winning two dollars in a contest sponsored by Keds shoes for the best essay about an animal. Then she finds out that nobody else had entered the contest. This doesn't take away from Cleary's delight in her prize. Instead, it gives her "one of the most valuable lessons in writing I ever learned. Try! Others will talk about writing but may never get around to trying." Yes! Success in writing belongs to those who try, those who sit down with pencil and paper and actually put words on the page, and then actually submit those words for publication. Unwritten stories win no prizes. Ditto for stories that aren't submitted. One of my sons once cried when he didn't win a drawing contest he hadn't even entered. Write! Draw! Enter! Submit! You may even win two dollars once of these days. Who knows? One of the highlights of the Children's Literature Association (ChLA) conference for me personally is our tradition of the "midnight feast," inspired by the reading of classic British boarding school stories that feature illicit nocturnal parties, often occasioned by the arrival of a hamper from home, in defiance of the stern headmistress. I am a proud founder of the ChLA midnight feast, together with scholars Laureen Tedesco and Jackie Stallcup. The first-ever ChLA midnight feast was held at the conference in Buffalo in 2001. That was the year I met both Laureen and Jackie; there was a shortage of rooms in the conference hotel, so a call went out for volunteers to be roommates, and the three of us found each other. Laureen, being both someone who spends an inordinate amount of time in used bookstores and someone who is inordinately generous, brought gifts for both Jackie and me, based on our research interests. I don't remember what book Jackie received that year, but I got a biography of Lucy Fitch Perkins, because I had published a scholarly essay on her "Twins" series. That year we also had conference side trips to Niagara Falls. One of our trio went on the outing halfway through the conference and brought back some lovely fudge. Fudge! Books! Girls who love books! We had all the makings for our first-ever ChLA midnight feast. The midnight feast is not held at midnight. Who could stay up so late? It's held after dinner on whatever evening of the conference works out for all of us, in one of our rooms (this year, we held it in the ground floor lounge of the dorm at Simmons University where we were staying). The feast is not on the conference schedule; it's more of a word-of-mouth gathering, but everybody is welcome. We bring candy, of course, and also some favorite book from which to read aloud. This year, Alisa Clapp-Intyre read aloud Make Way for Ducklings, appropriate as it's set in Boston and several of us had made a pilgrimage to visit the duckling statues in the Boston Public Gardens earlier in the week. Laureen had brought The House Between: A Story of the 1850's, by Ethel Parton (published in 1943), to give to me as a gift (I told you she was inordinately generous), because she thought the voice of the book was so much like mine that I must have written the book in another life. By coincidence, Marilyn Olson (also at the feast) had presented a paper on that very book the day before. Although Laureen had brought the book, I was the one to read aloud from it, to test Laureen's theory about the voice of the book: theory vindicated! The scene I read involved a dispute over whether young ladies should be allowed to attend the circus, so Jackie hastily downloaded Edward Eager's Half Magic onto her handy Kindle and read another circus scene to follow upon it. Then Claudia Nelson decided we needed "improvement," so shared several exemplary tales of "golden deeds" from the 1912 Book of Knowledge. Throughout the evening I consumed a prodigious quantity of Raisinets. Verdict: This was one of the nicest midnight feasts ever. Greetings from Boston, where I'm having a blissful time at the annual conference of the Children's Literature Association, which I attend every year. This is the national organization of children's literature scholars, mainly professors from English departments (as well as some historians and folks from cultural studies, childhood studies, women and gender studies, American studies, and other allied fields), who teach and write about children's literature as a field of academic endeavor. When I come to this conference, I take off my children's book author hat and put on my children's book scholar hat. I mainly take off my philosophy hat, but sometimes adorn myself with it when it is suitable headgear for my purposes, as it was this year. I was asked by my dear friend Lisa Rowe Fraustino to take part on a panel she was organizing on romanticism. The actual title for the panel was "The Romantic Child in the Literary Slipstream" - the conference theme this year is "Literary Slipstreams." Many of the papers involve a pleasing slipperiness across genres, historical periods, and/or critical approaches. So I wrote a paper on my beloved Jean-Jacques Rousseau, using his argument against premature moralizing to children in his treatise on the philosophy of education, Emile, to provide a lens for critiquing several recent children's novels that try to teach children to view others in a non-prejudiced way, but actually, in my view, actually work chiefly to introduce child readers to the very prejudices they are seeking to combat. I next consider a children's novel from about a decade ago, The Janitor's Boy, by Andrew Clements, in which the title character learns not to be ashamed of his father’s calling. At the same time, however, the story carries the message to young readers that it is indeed horrifically embarrassing to have one’s dad work as a custodian. Jack is the cruel target of kids who call his dad a "dum-dum" and ask sneeringly if he had to take a course in cleaning up vomit at a special janitor's college. Now, my own children attended an elementary school in which the custodian (I don't think they had ever heard the word "janitor") was a mega-cool woman, admired and respected by all the kids, a talented mechanic and handywoman who was a valued member of the school staff. If my kids had read this book, would they have learned not to be prejudiced against janitors? It had never occurred to them to be prejudied against janitors in the first place! I constrast Clements's book with Clementine by Sara Pennypacker. In this book, Clementine's father does maintenance work for the apartment building in which her family lives, but Clementine is proud to join her father in his war against "pigeon splat" on the front of the building, and they both achieve a gloriously satisfying tactical victory against the pigeon splat together. I argue that Rousseau would approve of Pennpacker's approach to combatting prejudice more than the approach that drives The Janitor's Boy. Anyway, that is the gist of my paper. I gave the paper this morning, and I think it went pretty well, though it was a tad longer than it should have been. But any paper about Rousseau is bound to be pretty good. and a Rousseau lover will be tempted to make any paper about Roussseau just a tad too long. Now I can relax and enjoy two more days of stimulating papers and reconnnections with beloved once-a-year conference friends until I fly back to Indiana on Sunday. This is the kind of job I have: as part of my JOB I was expected (well, warmly invited) to attend a three-day Prindle Institute retreat called "Living with Joy: The Science and Skill of Happiness." Our retreat leader, Douglas A. Smith, teaches DePauw's extremely popular, life-changing Winter Term course on happiness; as our preparation for the weekend he had us read What Happy People Know: How the New Science of Happiness Can Change Your Life for the Better, by Dan Baker and Cameron Stauth; the retreat was attended by DePauw alumni returning for Alumni Weekend, as well as current and retired faculty and staff, and one current student. My favorite attendees were two mother-daughter pairs. Can you think of any lovelier mother/daughter activity than attending a happiness retreat together? I won't be able to stay for the third and final day of the retreat, tomorrow, because I'll be on my way to the Children's Literature Association Conference in Boston. But here is some of what I have learned so far. Research in the field of positive psychology shows that only 10 percent of our level of happiness is caused by our circumstances; 50 percent is caused by our "set point" (influenced by our genetic makeup); 40 percent is caused by our voluntary choices. Happy people do better in life by almost every measure; they even live longer. One study measured the link between cheerfulness and longevity in nuns. Of those in the most cheerful quartile (assessed upon the time of their taking holy orders), 90 percent were still alive at age 85; of those in the least cheerful quartile, only 34 percent were still alive at that same age. What are the two key skills for making peace with one's past? Forgiveness (of others and of oneself) and gratitude. Men are measurably better at forgiving themselves than women are; women are measurably better at forgiving others. (Hmmm.....) Our leader, Doug, made the pronouncement that forgiveness is THE most essential skill for happiness. When we have painful events in our past, we only have four choices for how to deal with them: 1) forget them (good if you can do it, but most of us can't); 2) repress them (never works); 3) hold on to them (a heavy burden to carry); or 4) forgiveness. What are the four key skills for finding confidence in the future? Remember them by the acronym FOFO: faith, optimism, flexibility, and openness. In one study of survival in difficult situations: those who survive are those who 1) face reality, and 2) believe that anything is possible. Then we learned a range of skills for living in the present, ranging from "doing now what you are doing now" (i.e, be mindfully present as you do it), to honoring your mental, physical, and spiritual health (by asking yourself the question, "To whom and to what do I give access to my mind, body and spirit? "), altruism (mega-important for happiness), focusing on cooperation not competition (believing in a world of abundance, not a world of scarcity), mastering the stories we tell ourselves, finding purpose in our lives, and cherishing friendships. Then of course there are the five happiness traps to avoid, but that can be the subject for another post! I've absorbed all I can for one day. We alternated between large sessions and small group discussions, and I now love all the people in my small group from today (previously strangers) and will love them for all of time! Well, at the least, I am grateful to them for sharing this happiness journey with me, and to the Prindle Institute for hosting this event, and to the universe for letting me have a job where I actually get paid to spend two days learning more about how to be happy. That itself is cause for happiness. The whole point of my trip to China, of course, was to attend the first-ever Chinese/American Children's Literature symposium, jointly sponsored by Texas A& M University and Ocean University, and held on the campus of Ocean University in Qingdao, China. Twenty invited delegates attended, ten from each country, as well as a wonderful, lively group of students from Ocean University who asked good questions during the Q & A after each session. Papers were submitted by April 1 so that they could be translated in a timely way, and a book-length compilation of all the papers together with their English or Chinese translation was given to each delegate. Each paper/talk was simultaneously translated as it was being presented, so we all sat wearing little headphones, as if we were at the UN. Each American visitor was also assigned a student helper to assist in everything we might need, particularly in translation, as all were fluent in English as well as being native speakers of Mandarin. Above, see our students beginning their duties by warmly welcoming us at the Qingdao train station. It was hard not to be struck by the differences between the American papers and the Chinese papers, both in content and in style of presentation. The American papers were all "micro" in focus: examining one particular author, usually one particular text by one particular author, and often examining only one particular aspect of that particular text: "Embodied Metaphors in The Adventures of Huckleberry Finn," "Missionary Work and/as Children's Book Authorship in Elizabeth Foreman Lewis's Yung Fu of the Upper Yangtze (1932)," "Black and Beautiful and Bruised Like Me: The Black Aesthetic and Picture Books of Langston Hughes," "Representing Boys and Girls in the 1912 Book of Knowledge." My own paper was slightly broader, examining what I see as a trend in children's chapter books over the past few decades of books about spunky girls contrasted with books about wimpy boys. But I locate the origin of the trend in the books of one particular author, Beverly Cleary, and most of my paper focused on one particular scene in one particular book: the scene where Ramona Quimby gets the best of Henry Huggins-as-traffic-boy in Ramona the Pest. The Chinese papers were all "macro" in focus: sweeping overviews of trends in Chinese children's literature over the past century, many of them highlighting the seminal contributions of Lu Xunhe, a thinker and writer in the May Fourth (1919) movement, whose book How To Be a Father Today turned children's literature in the direction of child-oriented rather than adult-oriented works. The papers also seemed more "directive" than the American papers, more prescriptive of what children's literature ought to be. I'm not sure how much this difference in approach has to do with some underlying cultural difference, or from the fact that the Chinese scholars were drawn more from colleges of education than from departments of literature, or even from some sense of responsibility on the part of the Chinese scholars to their foreign audience, who would need to get a sense of the broad terrain of Chinese children's literature before focusing on individual trees and rocks, let alone leafs and pebbles. The two groups of scholars differed in style as well. Almost without exception, the American scholars read our papers verbatim, partly out of a desire to assist the translators, partly out of our own academic culture. Almost without exception, the Chinese scholars just stood before us and talked, often in an extremely lively and enthusiastic way, saying things that bore little perceivable resemblance to the text printed in the conference proceedings. So: macro versus micro, sedate versus exuberant. But it isn't true that "never the twain shall meet," because they met most happily for two days in Qingdao, China, last week. Here I sit, writing in my journal as I sit on the Great Wall! One of the best parts of any trip for me is keeping a journal of my experiences. I'm not ordinarily a journal-writer, though I used to be when I was in my 20s. I stopped because it felt as if I was mainly writing in my journal when I was sad or angry, and I didn't like the idea of amassing a storehouse of all these negative emotions (though I have to say that I was quite witty in my devastating portraits of bad boyfriends and failed relationships - but still.) So now I keep a journal only when I am on a major trip. It has to be a trip overseas to qualify. I start the journal as the plane takes off; I end the journal on the flight home. In between I write fairly obsessively, a record of all the sights I saw, but also a record of where I am right now in my life more generally and how my experiences as a traveler illuminate my current situation and help me distill wisdom for going forward. Roberta, Lynne, Kenneth, and I decided to go out for a little after-dinner walk. At 7:30 it was already quite dark - we must be on the eastern edge of the time zone. The day became happier again as we wandered through narrow streets with food on offer and people sitting at very low tables - portable ones brought from home? - to eat skewers of grilled chicken that looked more tasty than our own bland dinner. At a bakery, I bought a European-looking chocolate pastry that tasted like a Little Debbie snack cake. It hit the spot. I have been in sugar/chocolate withdrawal for days now. I hadn't bought my purse, so Roberta loaned me money. I told her I felt bad that I keep needing her to loan me money as I keep not having my purse with me. She told me that her mother would have called me "Minnie the Mooch," which got me to laughing and got her to snorting. Roberta has a singularly delightful snort. So now, years from now, "when I am old and gray and full of sleep," I can nod by the fire and take down this journal, and read about that evening in Qingdao with my fellow American scholars, and I'll remember how I was Minnie the Mooch, and how Roberta gave that little snort, and it will all come back to me. And I'll remember how I sat upon the Great Wall of China, writing, writing, writing. 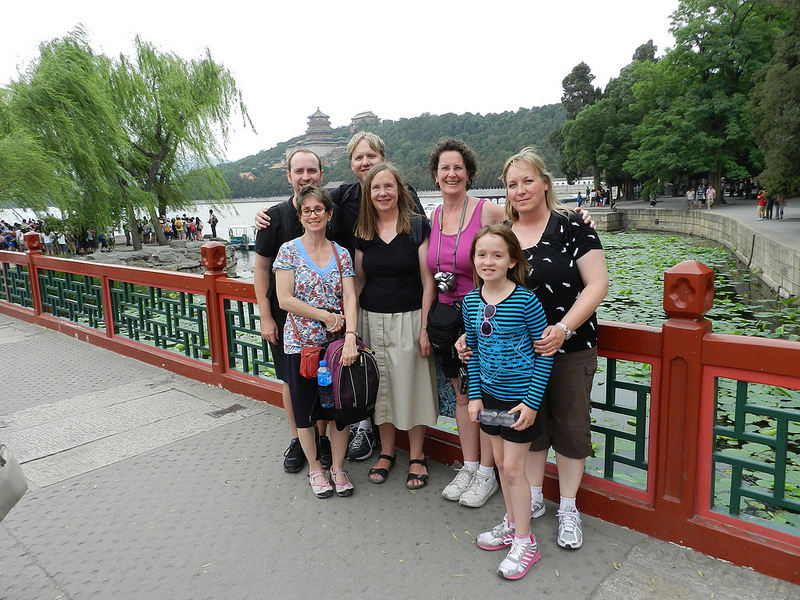 I got home last night, after a long day of traveling: Qingdao to Beijing, Beijing to Chicago, Chicago to Indianapolis. I loved every minute of the trip. My traveling companions were fabulous company; the picture above is some of us at the Summer Palace on the north side of Beijing. Our Chinese hosts could not have been more generous, organizing a guided tour for us to the Great Wall and the Summer Palace, booking our train tickets from Beijing to Qingdao and providing a Chinese-speaking/English-speaking guide to take us to the train station and put us directly into our first-class train car, and taking care of us throughout our stay in Qingdao. But I have to confess that my very favorite moments of the trip were the moments I spent alone. Each morning I would wake up before 5:00 and slip out of my hotel room, both in Beijing and in Qingdao, for solitary exploring. It was already light. I would walk and walk, for an hour or two or more, all by myself, to meet the city on my own terms. On the very first morning in Beijing, I walked past fancy corporate office buildings on posh broad avenues and high-end shops of all kinds and then came upon one street with lots of little side alleys containing tiny hole-in-the-wall eateries. I saw people at one table eating steamed dumplings, meat-filled little buns, from a round pan, so I pointed at some and bought a pan of my own for less than an American dollar. They were so soft, and warm, and juicy, and filling! So then, every morning, I made sure to find myself a pan of dumplings on my morning walk. In Qingdao, I also discovered a walk from the Ocean University campus, where we were lodged, to the promenade by the sea, with a pier jutting out into the water. On another day I found a neighborhood with flights of steps leading down to the water. And, of course, I found dumplings as well, over by the railway station. My fellow travelers started calling me the Dumpling Queen, I ate so many. I loved each dumpling so much! And I loved finding them all by myself, in a foreign city.